After countless debates on where to spend the weekend, my friends and I decided to go to Cagbalete. Thanks to the papal visit, we had another long weekend to linger away. Unfortunately, the weather did not agree with us so we got stuck in the island longer than expected. Cagbalete Island is situated in Mauban, Quezon. This place has been slowly gaining popularity as more and more people visit this beautiful island. We took the JAC liner bus in Buendia terminal bound for Lucena (P210). Buses leave every 30 minutes. We left around 2AM and took us 4 hours to get to Lucena Grand Terminal. 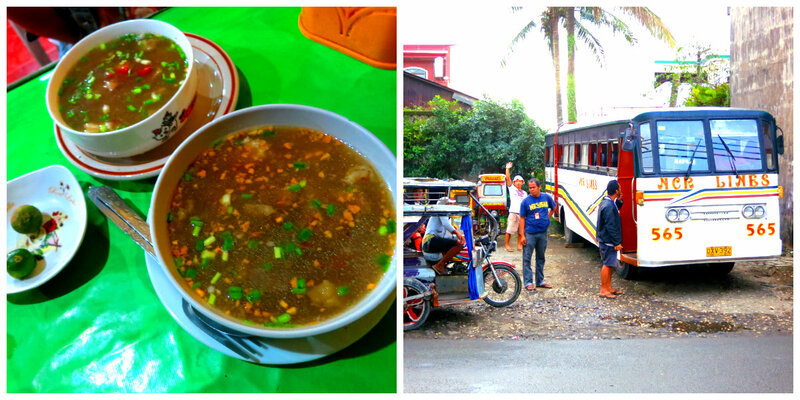 From there, you take a mini non-aircon bus to Mauban for 2 hours (P50). It was an interesting ride seeing how the locals go about their morning (except that I didn’t have any sleep so it was one hell of a ride for me). Oh, and expect various live stocks and sacks as your seatmate. L-R: Try the Batangas batchoy at Lucena Grand Terminal. ; Mini van to Mauban. Another option is taking the van to Mauban from SM Lucena (P60). Much more comfortable and takes less time as it has fewer stops on the way. From the drop off point, you can either walk or take a tricycle (P8/person) to Mauban port. There is a P50 environmental fee and public boats leave at 10AM.